Fan favorite and naming contest horse, Quoth the Raven is now a beloved pet and show horse for his new mom, Tammy! 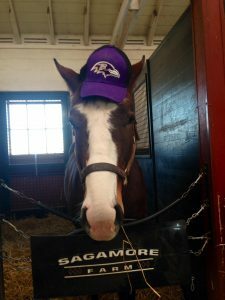 Our Sagamore fans named Quoth the Raven as he was born during the Super Bowl XLVII blackout in 2013. He has always been a sound and sweet horse. Although he never showed much interest in racing during training, Quoth the Raven has some impressive accomplishments in retirement. At his very first hunter show, he won champion! Then got reserve champion of baby green hunters at his second show. 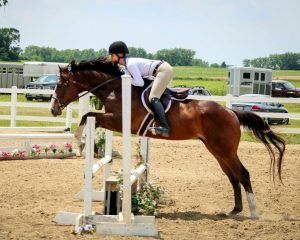 Tammy quickly learned that he had everything she needed in a hunter and was willing to jump from any distance! 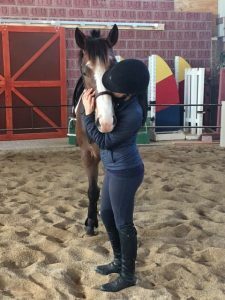 Tammy and her trainer loved his great big strides, lead changes, and willingness to jump. They are starting him slowly to allow him to mature through consistent training, and they are very impressed with how well he jumps and how quiet he is for only being a 4YO! Quoth the Raven is by Include and the first foal out of Dictate the Tempo, who is also mother to 2YO colt Baldie by Midnight Lute, a yearling colt by First Defence, and a new filly by Friesan Fire. We are so happy that our sweet homebred has a loving forever home and a second career where he can excel everyday. Special thanks to Tammy for sharing updates with all of his adoring fans! Can’t wait to follow his show career! 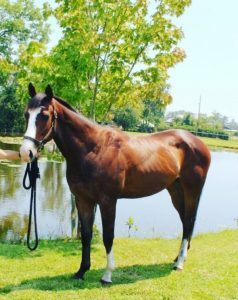 Stay tuned for more Thoroughbred Thursday stories, and follow us on Facebook, Twitter, and Instagram for updates.